Create premium ice cream sundaes, cupcakes, and other desserts with these bulk unwrapped KIT KAT® candy bars! Owned by The Hershey Company, KIT KAT® combines light and crispy wafers with a smooth and creamy milk chocolate coating. They have a long and rectangular shape that can be used for snacking or for decorating cakes and other special treats. 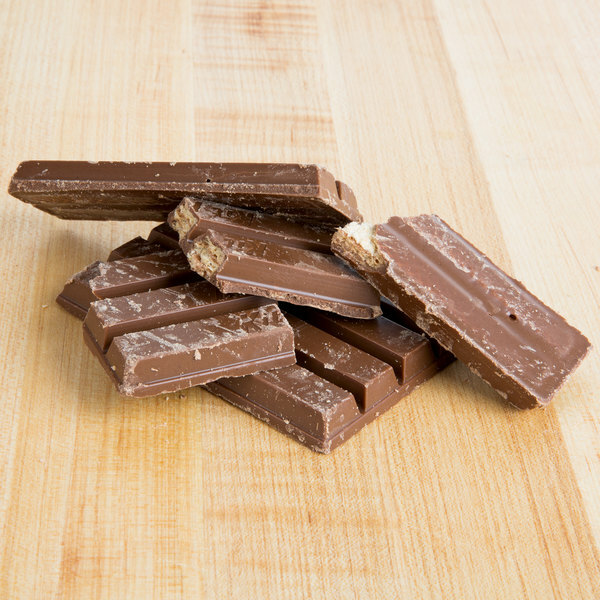 Since these KIT KAT® bars are unwrapped for quicker foodservice preparation, they can easily be chopped up into halves, quarters, or any size you desire. Get creative with these unwrapped KIT KAT® bars. Crush them up for a tasty sundae topping, or blend them into a signature milkshake. Offer KIT KAT® bars at your soft serve or frozen yogurt bar so your patrons can add just the right amount of flavorful ice cream toppings to their dishes. They're also great for serving alongside other candies, chocolates, and confections at your buffet. The sweet combination of flaky wafers and milk chocolate is also perfect for baking. Add something new to your menu and make cookies, cupcakes, cheesecakes, brownies, or pies with these KIT KAT® bars. These versatile candy bars are an excellent addition to your ice cream shop, diner, bakery, or restaurant. Great for garnishing or for baking, they'll bring freshness, great flavor, and the assurance of a beloved, recognizable brand to your business. So cool that you can buy these kit Kats in bulk and also all unwrapped. These are great for baking and if you intend on chopping them up anyways. if you're buying these to use as a aesthetic topping then I could choose to go with the wrapped ones. We received on time our order, they came with cold packages, so they did not come melted and they did not come broken, the flavor is delicious, the price is incredible, we are a frozen yogurt and we sell by weight, so this is a good deal for us, you just have to storage them very good so it won't get stale. I finally found a company who sells unwrapped bulk kit kat's. I use to put off making anything that called for kit kat's because I hated to have to unwrap all the wrappers...but now i don't have to, I can just cut them up as big or small as i need them and add them to my recipe or smoothie, cookies, and I can not forget they are awesome on top of ice cream! I also just eat them right out of the container. We were thrilled to find a large case of unwrapped Kit Kat candy bars for our bakery. We usually have to unwrapped pack after pack when making out kit kat cheesecake. The find is awesome and we will buy again. 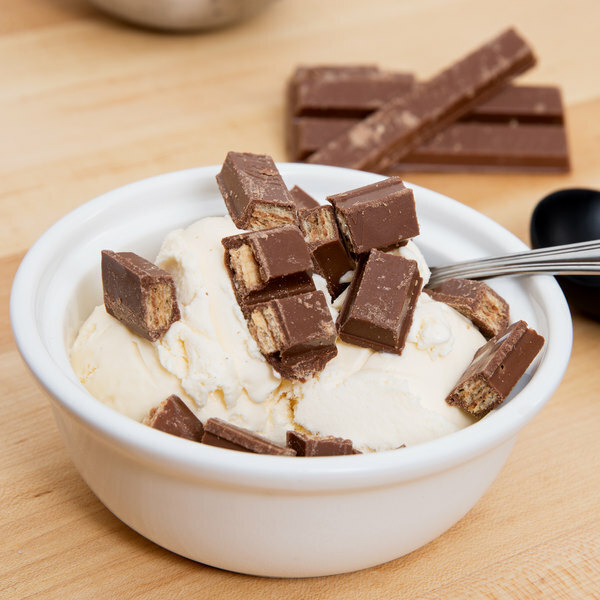 Kit Kat is great as an ice cream topping. Since they are unwrapped it makes it easier to get them into the serving container quicker. I definitely recommend this product. The 5lb Kit Kat unwrapped bars are the best for bulk & price. We use these in our store for our ice cream. 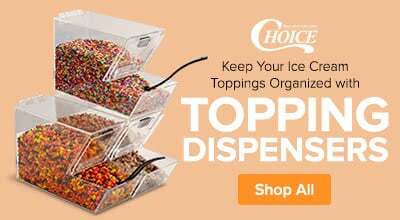 We love that we don't have to waste time unwrapping each of them and that they are still in bigger sizes so that our customers can easily grab them and stick them in their ice cream cups. Delicious and a great price! There isn't a lot of good tasting Kit Kat for toppings out there unless you buy a bunch of small bags of Kit Kat minis. These though, they come unwrapped and we just chop them up ourselves. Had a box delivered in 90 degree weather once and came melted. Webstaurant replaced them promptly! Awesome find an buy. No more unwrapping them. Great tasting and perfect for garnishing our kit kat milkshakes. Great flavor and great quality candy bar. While this may seem like a lot of money to spend on 1 topping, you sure do get a lot. Plus, there is nothing that even comes close to replicating kit kats. The Kit Kat unwrapped bulk bars are a great buy and they taste wonderful. A perfect garnish for our specialty sundaes and shakes. They are well packaged. These kit kat bars do come unwrapped, however that is exactly what we needed. Our customers love putting this topping on their ice cream and frozen yogurt. The unwrapped bulk bars of KIT KATS are really great. We make a kit kat pie and these are perfect. They were well packaged and very few broke during shipment. Pleased. A wonderful topping for ice cream or frozen yogurt that everyone will enjoy. The Kit Kat unwrapped is also great for making kit kat cakes. A wonderful buy on unwrapped kit kats that save us a lot of time unwrapping them individually. They are perfect for making kit kat cakes. I love kit kat bars so much. When I get a craving, I don't want to stop eating them. With 5 lbs of them around stopping would be hard! Kit kats have an awesome flavor. They are very light because of the wafer center but they can still cure a sweet tooth. I love eating the chocolate off of the sides then dividing the wafers and eating them separately. I can savor it that way. This as a great price for Kit-Kat bars. They are broken up a little but they taste great. These bars make a great addition to an ice cream Sunday bar. Our kids go through KitKats very fast. They eat them as a treat, but we have also made icecream with them, and used them as an icecream topper. I love that you can buy in bulk and get many uses out of products from here. We use to spend a lot of time in unwrapping and breaking up our kit kat bars we had to buy in bulk. But after finding this 5 lb. bag of kit kat bars already unwrapped we are one step closer to getting them broken and on our toppings bar a lot faster. Saves us a lot of time and headache on those busy days when we don't have a lot of time to waste unwrapping them!